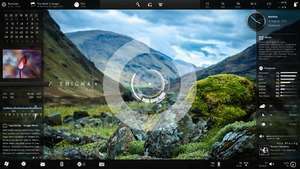 Rainmeter is a desktop customization and enhancement application which adds several tools to your Windows desktop which act as widgets/gadgets. Some of the most popular widgets include CPU usage, memory usage and network traffic. Rainmeter displays these on the desktop with various bars and indicators, depending on the style you choose. Some of the other optional addons you can activate are RSS feeds, clocks calendars and other system monitors. Version 4.3.0.3298 is a freeware program which does not have restrictions and it's free so it doesn't cost anything. For security reasons, you should also check out the Rainmeter download at LO4D.com which includes virus and malware tests. Additional screenshots of this application download may be available, too. Rainmeter has a presence on social networks. Rainmeter download been highly rated by our users.